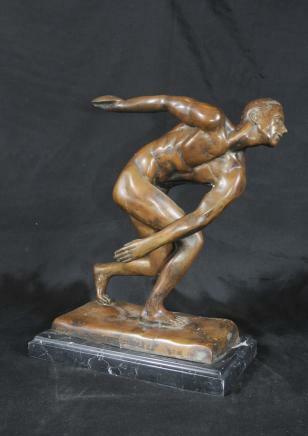 You are viewing a wonderful bronze casting of a Greek Olympian discus thrower that stands in at just over one foot tall. The bronze has a unique patina which I hope is illustrated well by the photographs – it’s a real collectors piece and in the right setting would look amazing with it’s museum like quality. The artist has really caught the poise and beauty of the athlete with great skill, check out how the light ripples of his muscles and the tone to his physique. We bought this from a dealer on London’s Portobello Road and will ship to anywhere in the world.